If you suffer from hemorrhoids, you know there have been limited over-the-counter options available to you for complete, multi-sympton relief. There are many products on the shelves, but many of them use the same medicine to shrink swollen hemorrhoids – and they’re not designed to ease the itching, burning and pain that comes along with hemorrhoids. 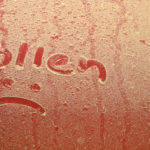 If you wanted pain relief, you would have had to purchase a second product to help. The key ingredient to quickly relieve those uncomfortable symptoms is lidocaine 5%, which is the highest strength available without a prescription. Lidocaine has been trusted for years as a topical anesthetic that provides rapid, effective relief of pain, itching and discomfort. Those suffering from the pain and swelling from hemorrhoids could have purchased products with lidocaine (for pain and discomfort) and phenylephrine HCl (for swelling) separately, but the makers of RectiCare®, the number-one selling lidocaine-based hemorrhoid relief product, have recently created the only dual-action formula that combines both very effective medicines for complete hemorrhoid relief. 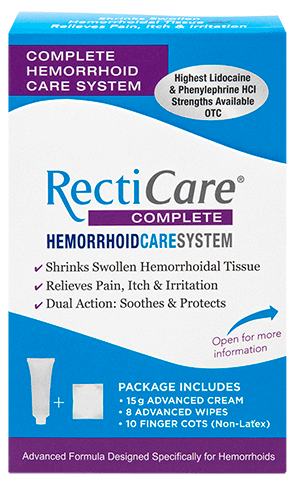 RectiCare® Complete Hemorrhoid Care System has both a soothing cream and individually wrapped wipes in one box. Both the cream and wipes contain lidocaine and phenylephrine HCl – in the highest concentrations available without a prescription. Patients no longer have to buy two products to get the relief they need from swollen, painful hemorrhoids. Many hemorrhoid sufferers, especially those with a chronic problem, need to have treatment available throughout the day, wherever they are. While the RectiCare Advanced Hemorrhoidal Cream is a very effective option, it can be inconvenient to apply when you’re not at home. That’s why the RectiCare Complete package contains the dual-medication cream and wipes together. RectiCare Advanced Hemorrhoidal Wipes are perfect for when you’re on-the-go. The wipes are convenient, individually wrapped and disposable, making it easy to apply the medication you need without a difficult, embarrassing mess. Combining the dual-action wipes and cream in one box is not only convenient and effective, it’s also a better value for those seeking complete hemorrhoid relief. RectiCare is trusted by colon and rectal surgeons because RectiCare is known to work exceptionally well. For effective, multi-symptom hemorrhoid relief, buy RectiCare Complete now wherever you shop, including CVS/pharmacy and Walgreens, or learn more at RectiCare.com. If you have more questions about your condition or the treatments that can help, or your condition worsens, contact your doctor immediately.